The Rowans' rambling Maine farmhouse is just big enough to contain the family members gathered there in the week before Christmas. Becca Rowan has driven north from Boston with one thought in mind - reclaiming the daughter she gave up when she was a frightened teenager. Raised by Becca's older brother and his wife, Rain Rowan, now sixteen, has no idea she was adopted. And though Becca agreed not to reveal the truth until Rain turned twenty-one, lately that promise, along with all her career success, counts for little in the face of her loneliness and longing. But while Becca anticipates shock at her announcement, she's unprepared for the depth of her family's reactions. 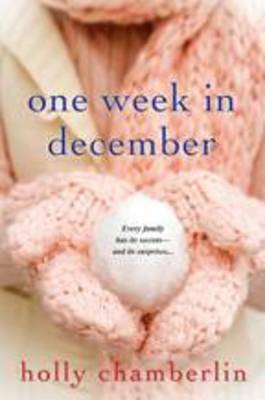 Her brother is angry and fearful of losing the daughter he adores; her sister Olivia, oblivious to her crumbling marriage, reveals long-buried resentments, while Becca's parents are torn between concern and guilt. And as the Rowans' neighbour, Alex, draws her deeper into an unexpected friendship, Becca begins to challenge her own preconceptions about family, about love, and about the courage needed to live with - and sometimes change - the decisions we make. Holly Chamberlin was born and raised in New York City. After earning a Masters degree in English Literature from New York University and working as an editor in the publishing industry for ten years, she moved to Boston, married and became a freelance editor and writer. She and her husband now live in downtown Portland, Maine, in a restored mid-nineteenth century brick townhouse with Betty, the most athletic, beautiful and intelligent cat in the world. Readers can visit her website at: www.hollychamberlin.com.